Breathtaking corner residence complimented with a floor to ceiling glass curtain wall overlooking the harbor from both the master bedroom and living/dining room. This residence is meticulously designed with innovative, contemporary finishes and open living concept. The gourmet kitchen is complete with Gaggenau appliances, wine refrigerators & water fall marble islands. A private balcony with stunning water views is directly located off the spacious living/dining rooms. Benefit from the convenience of both valet & self -parking options from the 2 single parking spaces, personal concierge services, fitness/wellness center, virtual golf, a dog spa, a private lounge with gas fireplace, catering pantry & kitchen with adjoining terrace equipped with grill, fire pit & wet bar overlooking the waterÂ?perfect for entertaining. Enjoy high quality waterside dining at Woods Hill Table on the first level of Pier 4. 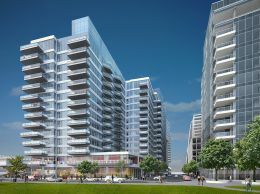 Pier 4 is an ideally located collection of 106 luxury boutique waterfront residences.